Running – I’ve been doing it! I ran between 5 and 7.5 every morning this week (except for a pool run on Wednesday). Reading – I’m finally reading The Girl with the Dragon Tattoo. It is creepy and I am having nightmares. Work – Trying to teach myself how to make CGI-style movies in Google Earth Pro – anyone know how to do this/wanna help a girl out? Friends – LOTR party tonight! I baked a variation on this. Totally psyched. Ok and now for Best of the Week! With the completion of the conventions last week, election season is in full swing, which means bring me the finest muffins and bagels in all the land! Because I’m watching West Wing from episode 1 (again). To find out what cues the players were responding to, the researchers filmed the students’ five-minute conversations before the game started. They discovered that four specific gestures predicted when a person was less trustworthy: leaning away from someone; crossing arms in a blocking fashion; touching, rubbing or grasping hands together; and touching oneself on the face, abdomen or elsewhere. These cues were not predictive by themselves; they predicted untrustworthiness only in combination. Farther and Further -- The word “farther” implies a measurable distance. “Further” should be reserved for abstract lengths you can't always measure. e.g., I threw the ball ten feet farther than Bill. e.g., The financial crisis caused further implications. Nauseous -- Undoubtedly the most common mistake I encounter. Contrary to almost ubiquitous misuse, to be “nauseous” doesn’t mean you’ve been sickened: it actually means you possess the ability to produce nausea in others. e.g., That week-old hot dog is nauseous. When you find yourself disgusted or made ill by a nauseating agent, you are actually “nauseated.” e.g., I was nauseated after falling into that dumpster behind the Planned Parenthood. Stop embarrassing yourself. Whether and If -- Many writers seem to assume that “whether” is interchangeable with “if." It isn’t. “Whether” expresses a condition where there are two or more alternatives. “If” expresses a condition where there are no alternatives. e.g., I don’t know whether I’ll get drunk tonight. e.g., I can get drunk tonight if I have money for booze. Moot -- Contrary to common misuse, “moot” doesn’t imply something is superfluous. It means a subject is disputable or open to discussion. e.g., The idea that commercial zoning should be allowed in the residential neighborhood was a moot point for the council. Time to go to the zoo?? "National Zoo Welcomes Baby Gazelle." Dama gazelles are native to the Sahara Desert and sub-Saharan grasslands, particularly in Niger, where it is a national emblem. This interactive map shows information about major rebel movements in Africa. 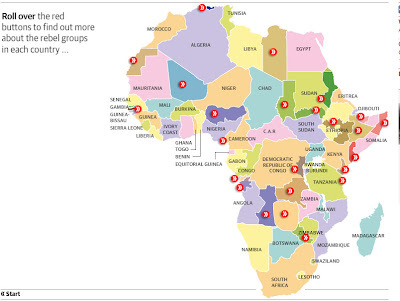 "The separatist map of Africa: interactive." Hmmmm I guess that's all I have for you this week. Anything to share with me?